Bath towel with a sports motif and your choice of personalised name and sports team name custom embroidered. 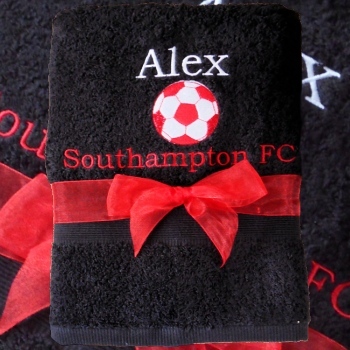 Bath towel with a sports motif and your choice of personalised name and sports team name custom embroidered. A unique and useful gift for home, gym, spa, birthday, anniversary or fathers day gift. Single Bath Towel 75x125cm in your choice of towel colour. Select from a sports motif listed. If you want a different sport email us and we will see if we can do it. Personalised with your choice of text, A name and or a team name. Please tell us the two main team colours for embroidery. Please note: Custom embroidered gifts are made to order dispatched in about 2 days.